Apparently, going blond was just one part of the transformation. Miley Cyrus, who debuted a new, light ‘do recently, has decided to bring the scissors back for a much shorter and dramatic haircut. Yeah, she pretty much chopped it all off.Liam Hemsworth’s fiancée showed off the new look on Twitter tonight, and wrote, “Never felt more me in my whole life.”And apparently, people seem to approve of her edgy hairstyle—well, kinda.“someone just told me im prettier than Miley Cyrus,” she tweeted. “most successful Sally day EVER! 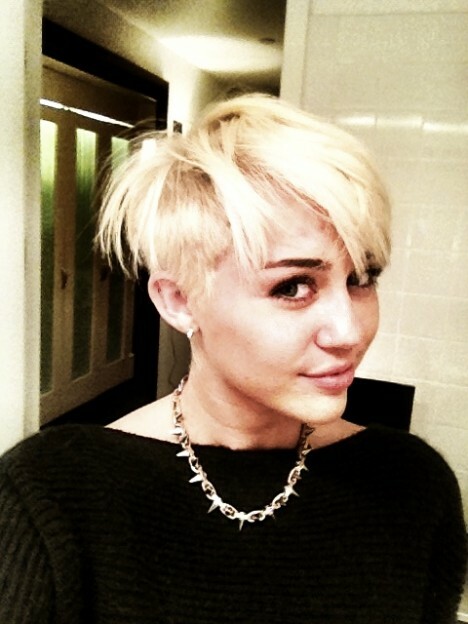 I feel pretty ohhhh so pretty and gayyyy”What do you think of Miley’s new look?